The Chinese Partner v6.5 for Windows 2000/XP/Vista/7/8 (32 bits)* (CP) is the ultimate global multilingual system for Chinese language. Designed with powerful features and intuitive interface, it enables complex Asian language processing in standard English Windows as well as localized Windows. Serial number will be provided through separate email notice. Fully compatible with MS Office suite and most applications under Windows. Enable you to display, edit and print Chinese (simplified and traditional) documents, spreadsheets, PowerPoints, E-mails, etc. 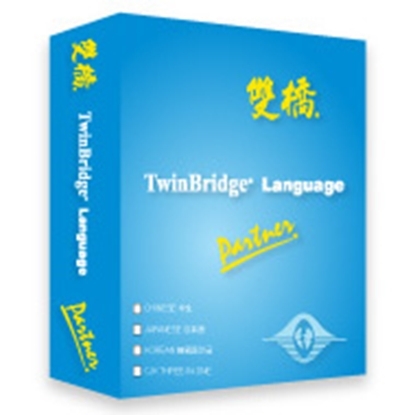 Supports most internal codes including Unicode for Chinese characters. 11 Chinese high quality True Type fonts for both ANSI and Unicode applications. Perform dictionary management for Chinese input methods: Indexed Phrase, English-Chinese, Yueyin and Changjie. Dictionary entries can be easily modified, added or deleted. The Chinese Partner Input Methods provide fast Chinese characters entry with Pinyin, Zhuyin, English-Chinese, Stroke, etc. Characters and phrases are sorted in frequency of use for convenient selection. Allows conversion among GB, B5, GBK, BIG5+ Japanese EUC (JIS), Japanese Shift-JIS, Korean KSC Code and Unicode standards in text (ASCII) format and RTF (Rich Text Format). In the RTF mode, certain document attributes such as font information, e.g., bold type will be retained. Easily converts non-Unicode documents for Unicode applications. Certain graphics applications do not accept input of CJK characters. These tools convert double-byte CJK characters into single-byte data then insert them as graphics into applications such as AutoCAD. The Chinese system in the Language Partner supports three user-defined input methods. The custom input methods, coding rules, and features will function according to the definition. Please make sure your previous software is registered. The Japanese Partner for Windows 2000/XP/Vista/ 7/8 (32 bits)* is the ultimate global multilingual system designed with powerful features and intuitive interface, it enables complex Asian language processing in standard English Windows as well as localized Windows. You can easily edit and print Japanese and English texts into Word, Excel, PowerPoint, Access, FrontPage, Sun StarOffice, Outlook, PageMaker, PhotoShop, PeachTree, Eudora, MSN Messenger and other MS compatible applications. The Korean Partner globalizes Korean in Windows and provides superior compatibility of multilingual processing to computer hardware, Windows platforms and Windows application software. You can easily edit and print Korean and English texts into Word, Excel, PowerPoint, Access, FrontPage, Sun StarOffice, Outlook, PageMaker, PhotoShop, PeachTree, Eudora, MSN Messenger and other MS compatible applications.